StudioLive AR16 USB mixers are packed with the connections and controls needed to mix and record live, in the studio, and in rehearsal. Each of the eight mono channels and four stereo channels includes a 60 mm fader for level control; a mic input with one of PreSonus’ prized Class A preamps; three-band EQ; and more. Besides the main outputs, you get two monitor mix outputs, each with a dedicate bus, for feeding stage wedges, a headphone amp, or an in-ear system. 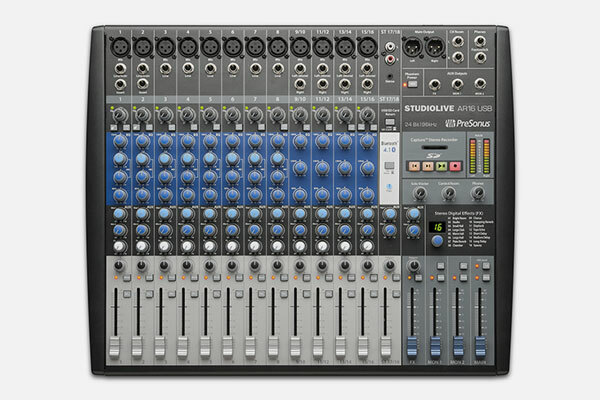 Since the StudioLive AR16 USB is also a studio mixer, you also get control-room outputs with level control to feed your studio monitors.